This individual detached house has been BUILT TO AN ATTRACTIVE RANCH STYLE DESIGN with stained weather boarded elevations under a tiled roof. The property has an overall square footage of 3200 square feet providing extensive and flexible family accommodation arranged over two floors. Externally there is a broad forecourt providing parking for a number of cars and good sized fenced garden to the rear with terracing, lawns and a variety of shrubs. There is a broad open porch at the front of the property leading to the front entrance door and the good sized hallway. The house has two very large reception rooms, both with a westerly aspect and doors to the rear garden, a study, and shower room. The spacious kitchen/living room extends in all to 33ft x 22ft and is exceptionally well fitted with an extensive range of worktops, cupboards, and drawers together with an island unit housing the gas hob with extractor above. 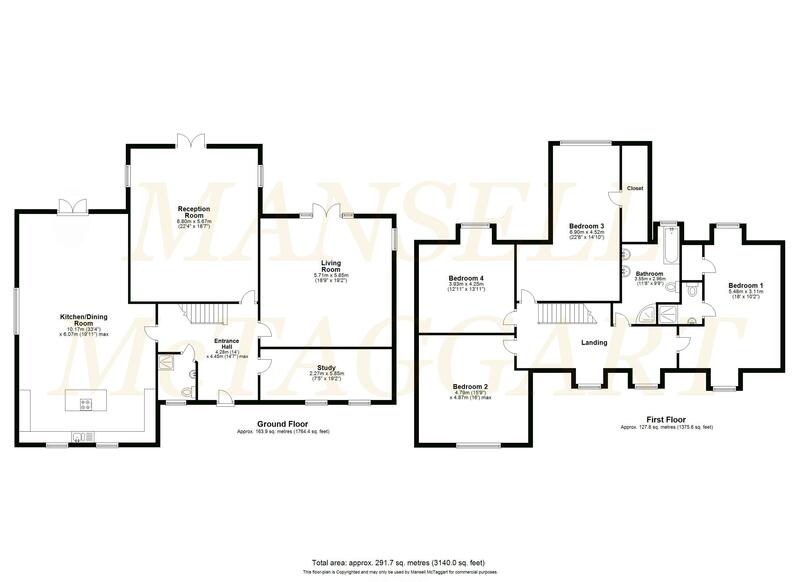 On the first floor there is master bedroom suite with built in wardrobe cupboards and an en suite shower room, together with three further double bedrooms and a family bathroom and a galleried landing. The whole provides an interesting and incredibly spacious family home close to the Forest and just over one mile from the centre of Forest Row. Council Tax Band: G EPC Rating: C (76) Directions From the centre of Forest Row take Priory Road, behind the church, and continue for about one mile and the house will be seen on the right just after the drive to the Equine Vet. The lively and extremely popular village of Forest Row is located on the northern edge of East Sussex within three miles of the market town of East Grinstead with its exceptionally wide range of shops, leisure amenities, picturesque and historic High Street, and main line station with service to Victoria/London Bridge via East Croydon. The house stands within a few hundred yards of the Ashdown Forest with its 6,400 acres of heath/woodland for riding (by permit), walking and its varied bird/wildlife. The property stands on a south-east facing plot with a westerly rear garden in a rural location just over one mile from the village centre. Forest Row has a surprisingly extensive range of specialist stores, village shops, cafes, restaurants, and a modern Health Centre. Forest Row has a range of sports clubs and a fitness centre, together with a popular golf club, and the Weirwood Reservoir for angling and sailing. Further sports venues within a thirty mile radius include Lingfield Park and Brighton Racecourses, a number of additional golf courses, football stadiums at Brighton and Crawley. Places of interest nearby include Sheffield Park and Wakehurst Place Gardens, Hever Castle and the Bluebell Steam Railway. Schools are well represented with a good number of bioth state and private schools closeby including Michael Hall Rudolf Steiner, Ashdown House and Brambletye, a village primary school and Cumnor House at Danehill.